On Sunday, the recovering gerg and I slipped and slid our way through slush to Cedar St. in St. Paul to attend Minnesota Public Radio's (MPR's) 40th anniversary open house. Free parking was offered at the ramp next door, so a brief elevator ride and jaunt through the slush ended at the lobby of the MPR Headquarters building. We enjoyed a self-guided walking tour and a commemorative gingerbread cookie (pictured above). Copped a squat at the UBS Forum to listen to a brief love speech by Senator Amy Klobuchar; then midday host Gary Eichten interviewed MPR President Bill Kling. 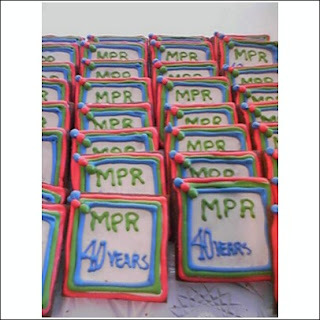 They talked about the history of MPR - where it started and why. We stopped by 89.3 The Current's Founding Members' Wall to peep gerg's name, and it wasn't there!! JEERS!! He's got the vinyl and certificate to prove his status. What up wit dat? We chatted briefly with Mark Wheat and the local show's Chris Roberts while gerg collected their autographs. I was anticipating Barb Abney and Mary Lucia too, but no luck! I want to send a special shout out to The Current's Barb Abney and Steve Seel for playing my special request on Friday for gerg. We listened to The La's "Feelin" on the way home in honor of gerg's homecoming. Dang, I am sorry I missed you guys. I was back in the Morning show studios conducting tours! Nice pic of the cookies, BTW. Tell Gerg I hope he's feeling better. (see what happens when you google your name?) Nice. Catch you guys next time! Thanks again for the shoutout to gerg. I might be calling again tomorrow.